1 of 3 Heat oven to 300 degrees F. Coat a large rimmed baking sheet with nonstick cooking spray. 2 of 3 In a medium-size bowl, combine the oats, almonds, cherries, maple syrup, salt and cinnamon. Stir until well-combined, then spread onto prepared baking sheet. Bake at 300 degrees F for about 35 minutes, stirring halfway through, or until golden brown. Remove to a wire rack and let cool completely. 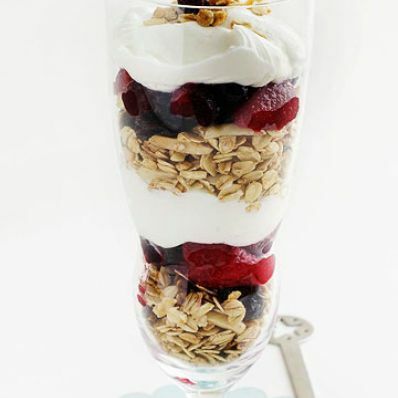 3 of 3 Place 1/4 cup granola in the bottom of serving glass, then top with 1/4 cup berries and a scant 3 tablespoons yogurt. Repeat layering once more. Repeat with remaining glasses. Per Serving: 10 g fiber, 103 mg sodium, 0 mg chol., 0 g sat. fat, 62 g carb., 6 g Fat, total, 12 g pro., 348 kcal cal.